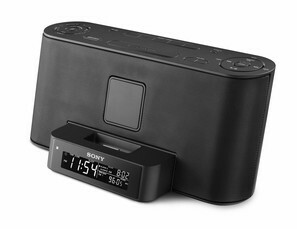 The Sony ICF-C1iP is a speaker system with alarm clock that supports iPod and iPhone. It is offered in white and black versions. A large LCD display is located in the front of the dock which displays current time, current mode (iPod/iPhone, FM, AM, or audio-in), alarm type and time. 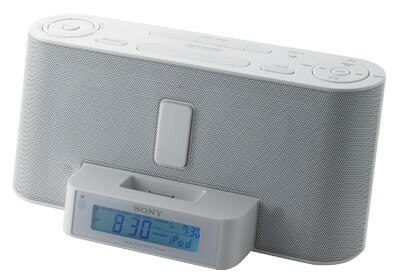 While the JBL speaker systems use a minimal design with only the two volume and power buttons, Sony's ICF-C1iP has many buttons on top of the system for accessing all the system's time related settings. In the middle houses a large snooze button. Also in the middle are five preset buttons for saving your favorite radio stations per FM1, FM2 and AM for a total of 15 preset radio stations. To ensure clear reception, the ICF-C1iP has a built-in FM antenna as well as a separate detachable AM antenna. Although all the functions are accessible on top of the ICF-C1iP, it comes with a remote that provides similar functions. An auxiliary line-in and a stereo patch cable are included with the system. Remote Control: The remote provides similar functions as the buttons on top of the system. Inputs / Outputs: There is an auxiliary input for playing music from your mp3 player, music-enabled phone or cd player. It is a good sound quality. 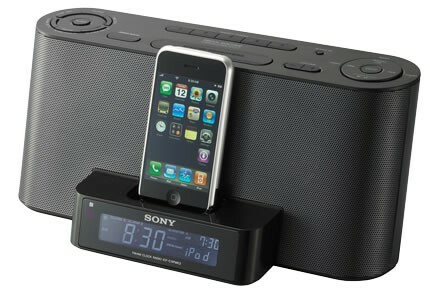 I have the Bose sound dock at home and I actually think this device sounds better. If you have a iPod touch, ipod or a older iPhone >=2G then you are fine. 3G/4G iphone owners watch out. Great sound, compact, and nice design. Major: Is not compatable with iPhone 3G and 4G phones... sorta It will play your music but there is a waring message that pops up every time you connect the phone to the dock that says the device is not made for use with this iphone (3G 4G). It will play but after the 3rd song it makes a pulse/clicking sound through the speakers like when you leave your cellphone next to your computer speakers and a incoming call comes in but the phone has not got a chance to ring yet. I switched the phone to airplane mode and turned off the service completly thinking it was the cell service pinging towers but the sound still happens through the speakers. Also the built in FM only works if you have a strong FM signal. Not a great system if you work in the basement or in the center of a large building. Minor: the LED display is weak and if direct sunlight hits it you cant see the time/station. No external speaker out port.